Today's Wedding Bliss post is all about assembling your team of vendors for the day! After we made our venue decision (the gorgeous Holman Ranch! ), I wanted to compile a team of vendors who were more than just a vendor– I wanted to have a team of artists and people I genuinely loved, not just admired their work. Since I’m immersed in the wedding industry a bit, I had a good idea of some people I wanted to have as a part of our day! Since this is often one of the most daunting aspects of pulling together your wedding day, I’ve come up with a few tips to help you compile your wedding day vendor team. Even though I plan events as my job, I knew I needed someone amazing to help coordinate our wedding. Enter Allison and Audrey of Engaged & Inspired. 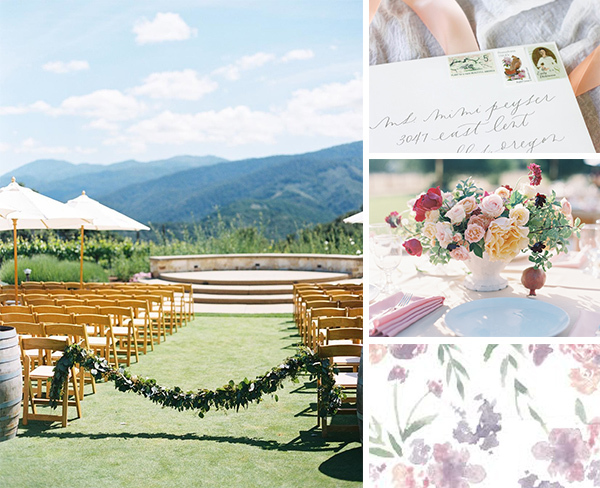 Not only do they create beautiful events, but they also work at Holman Ranch often, so I was incredibly confident in their ability to coordinate for us. I’ve also followed Allison on Instagram for years and know she is kind and talented. I know my family and I can rest easy, knowing we are in great hands! Once that was settled, on to the next vendors! One of my sweetest friends in the wedding industry is Danielle of Danielle Poff Photography. It was a no brainer that she would shoot our wedding! I love her personality, her style of art, and that she shoots with film. So dreamy! Next up, we decided on the ever-talented Michelle Lywood for our flowers. With a joyful spirit and genuine love for people and whimsical, natural flowers, I knew this was the perfect match. Beautiful flowers are what dreams are made of! Then we nailed down our caterers. As I mentioned, we wanted a cohesive team of people for our wedding, so when both Holman Ranch and our coordinators suggested Paradise Catering, there were no questions asked! Going with a company who comes highly recommended is so comforting. Shortly after this, we decided on our DJ who came highly recommended as well, John Belmont Entertainment. I totally trust our wedding will flow perfectly because of everyone on our team. Also exciting is picking people to help make your day feel special and beautiful, but who aren't actually there on the day of the event. An example of this type of vendor would be a calligrapher who does your signage for you. After working with Jenny of Graceline for Bloom a million times, and then meeting her in person last year, I really didn't have a hard choice ahead of me for my calligrapher. Jenny is THE sweetest soul I've ever known, we share the same passion for design and beauty, and knew she'd be perfect in bringing our wedding vision to life, even before guests arrive on the day of! You guys, I cannot wait to share bits of the invitation and envelope liners Jenny has made. See those watercolor florals up in the image above? That's a small corner of our liner! ALL THE HEART EYES. Determine your budget. This dictates everything you plan for your wedding, including which vendors you can work with! sometimes vendors will list their minimums or starting prices on their website. If not, email them to inquire! Nail down your style & feel for the day and make a list of vendors who fall in line with your style. Go through their websites, look at their work on other websites, etc. You want to familiarize yourself with the styles of each potential vendor! Determine your top 3-5 most important venders / aspects of your wedding. Personally, I think the venue, photographer, catering, and coordinator / wedding planner are the most important aspects. I say this because the venue dictates the overall feel of the day, the coordinator determines how successful the flow of the day is, the photographer is the only vendor that preserves your wedding for a lifetime, and the catering is what keeps your guests happy :) Of course I see my entire as equally important in the greater scheme of things, but these were the first few we hired. Ask around, research and meet with your vendors. Before hiring and signing on the dotted line, make sure you ask friends who they worked with, what they liked and didn’t like about their vendors, ask your wedding planner who he/she prefers to work with, read online reviews, and of course, be sure to meet with said vendors before hiring them! You really want to make sure you’re on the same page with the style, the cost, and ensure your personalities are a good match. As I mentioned, I not only wanted to hire talented vendors, but I also wanted to hire people whose heart and passion I could easily see. This is a big day for us, so anyone I could hire that would be equally as excited as us was my goal! Hire one or two key vendors first and then get their suggestions for the rest of the team. How did you choose your vendors? Is there anything you would do differently looking back? This post was originally written for Style Me Pretty as a part of my Blogger Bride series.